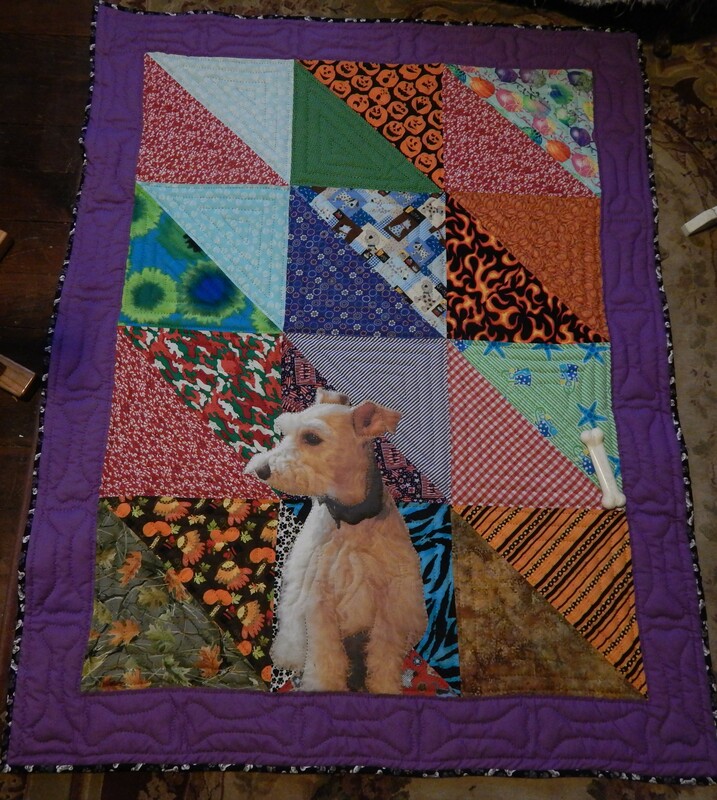 I worked on the quilt for Teddy over the weekend and I finished it Sunday night. see the post about the quilting here. Since the hand quilting was very simple It went pretty fast. Teddy has a favorite toy, a fake dog bone, so I used that for the border design. Here it is all quilted and before binding. It is made from the bandanas he gets from the groomer and I kept the piecing simple so they would still look like what they are. 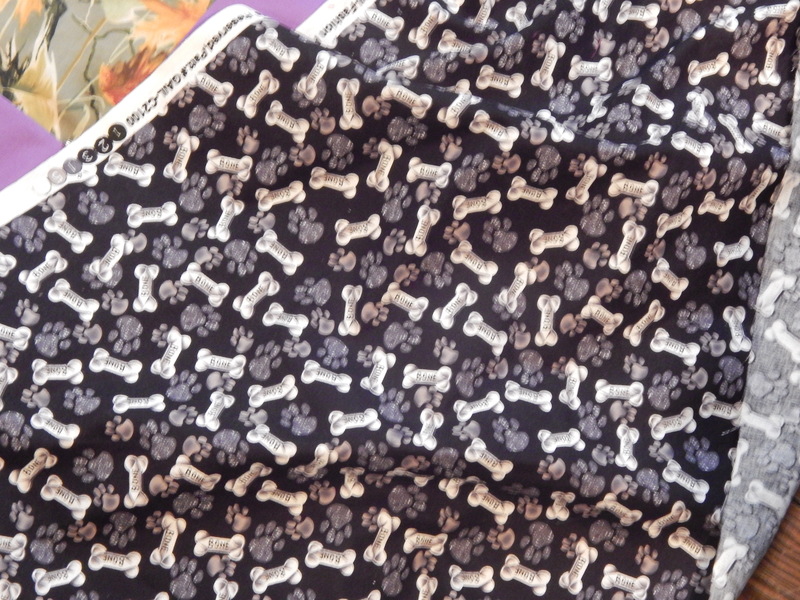 I also kept the quilting on the bandanas very simple, just outlining the pieces . Here it is after binding. Here are a bunch of pictures …. Finished it just in time for the cold fall weather…..it has been going down to the 30’s and 40’s at night. 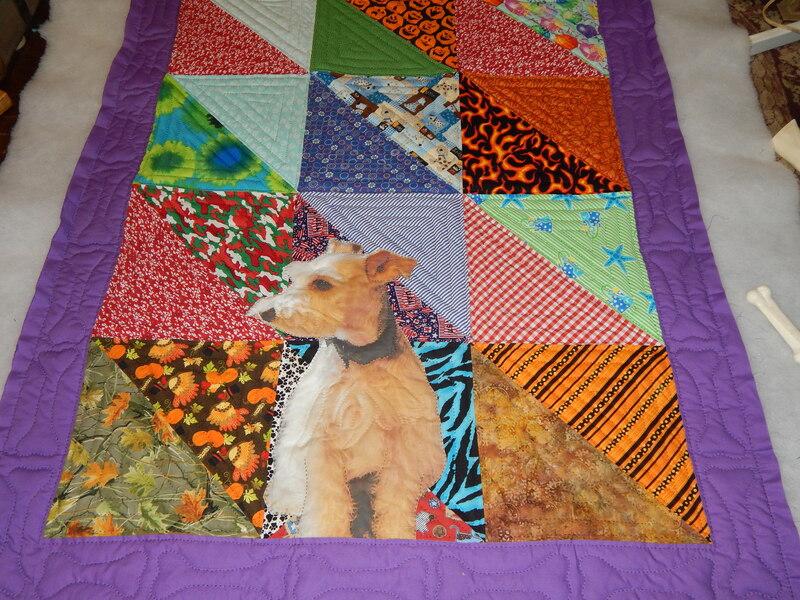 This entry was posted in Quilts and tagged hand quilting, Teddy Quilt. You can tell Teddy loves it! It’s so DOGGONE CUTE! Life imitating art – very fun quilt, nicely done! Give Teddy a scratch from me. So cute and Teddy seems to know it belongs to him. Both Teddy and his quilt are so cute! Congratulations Tim, Teddy seems to know the new quilt is his. Enjoy!!!! Onward and upward, or should I say, keep the pile of UFO’s going down. Have a nice fall season. Such a proud looking little guy…..love that dog!! What a great use of his scarves and the bone quilting in the border was a nice touch. I was in Des Moines last week and got to pop into the AQS Quilt Week Event for a few hours Saturday morning. I saw two of your quilts “in person” and got to admire your work up close and it is even more impressive than photos can reveal. You are so talented! Will the real Teddy Latimer, please stand up! (Remember that show?) 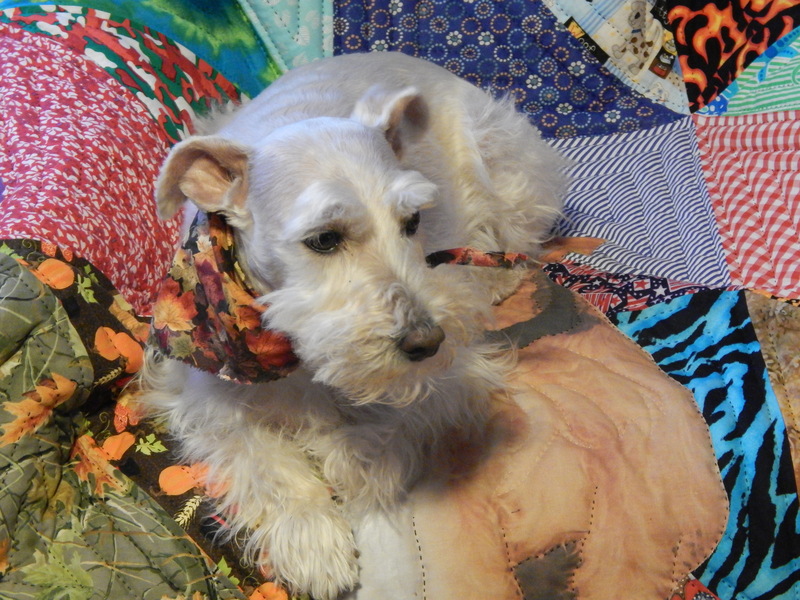 The print is so lifelike, it is deceiving when they are both on the quilt. What a fun project. VERY nicely done Tim and Teddy looks happy with his new quilt. I like the straight line quilting. I just finished a quilt this weekend that has wool applique. Sigh… now how to quilt it! Choosing the quilting is always my biggest dilemma. I’ve read to let the design speak to you. Well, my design is not talking yet. 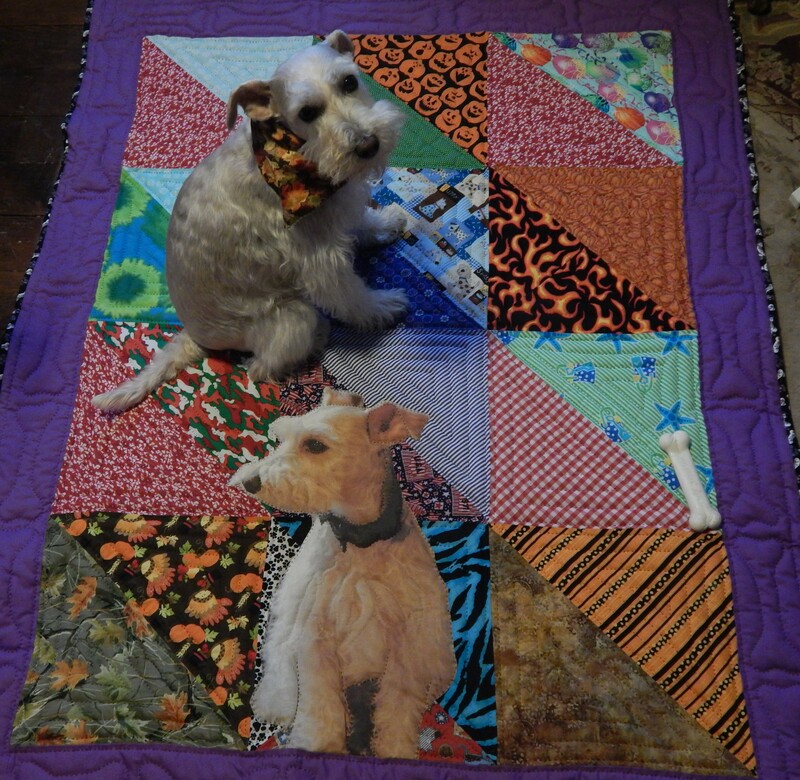 You and Teddy chose well on his quilt! I really do think that the quilt does talk….but I have several that I haven’t started quilting yet because they have not talked yet! Too cute! I love it! And I know Teddy does, too. You should show it to your groomer, or at least take him/her a photo and some business cards – I’ll bet you would get more than a few commissions! 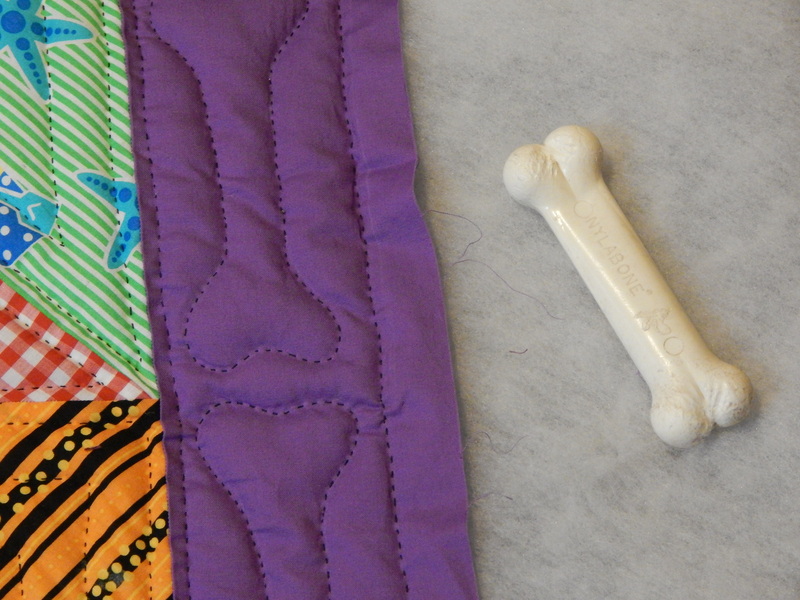 The ‘bone’ quilting is inspired. It was a clever concept, love the execution, and Teddy finally gets a quilt he can lie on all the time! May I ask a newbie question? When you finish one of the bandana triangles and move on to an adjacent one, do you knot/cut the thread and start fresh, or just “feed” the thread under the quilt top to the next triangle?